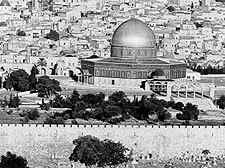 SHRINE UNDER SIEGE describes the coalition formed by Fundamentalist U.S. Christians and militant Israeli Jews to destroy the Dome of the Rock, Islam's third holiest shrine, and to build a new Jewish temple in its place. The documentary explores the theological background to this unusual coalition and places it within the context of the increased political power of fundamentalism in the U.S., and the rise of extremist religious parties in Israel, as demonstrated by the election of Rabbi Meir Kahane to Parliament. Chronicles the first year of the implementation of the Israeli-Palestinian accords as experienced by both Palestinians and Israelis from all walks of life.